Out of sight, out of mind. That’s kind of how people tend to live their lives. Unfortunately, when it comes to home ownership, this mindset could be dastardly and destructive. So, when it comes to foundation repair in Dallas, we really want you to be in the mindset of prevention. Your home is your castle, and if there are any chinks in the defense, you need to know about them immediately. This is why Foundation Repair Dallas is here to help you understand what causes foundation stress and how you can ensure your castle has a firm foundation. Especially after recent flooding, we want to make sure our property has proper drainage. Moving water away from your foundation will keep it safe from water erosion and soil erosion. Water is a powerful force. It’s powerful enough to move 1.65 billion tons of sediment into the oceans from streams and rivers alone in one year. This erosive force is working on your house and foundation constantly. But, how can you protect your foundation from water erosion? Drainage. You probably don’t realize it, but your gutters and downspouts are extremely important in protecting your foundation. They funnel rainwater off your roof and away from your house. But your gutters and downspouts will be useless if you don’t have at least a 5% downgrade to the rest of your property. If a contractor or homebuilder did things correctly, you won’t have to worry about this aspect. But, a downward slope away from your house will allow the water sliding off your house to drain away. If you don’t have a downward slope away from your house, add soil. Then add some ground cover to keep the soil in place. If this isn’t an option, at least add a moisture barrier to your foundation. You also want to control the kind of erosion that happens in your greater property. The land around your house also helps keep your foundation safe. If you don’t have landscape features that keep soil in the yard, make sure you do so immediately. Plant grass. Build paver walls. Your lawn will look beautiful and you’ll avoid foundation repair in Dallas. A french drain is another option to keep your foundation safe. These are perfect for floor foundations with footings below ground level. Dig a trench along your footing. This should be two feet wide. If you have a basement, it will have to be as low as the basement. In the trench is where you should lay the pipe. Some people put gravel as a foundation for the pipe. Some places recommend gravel on top of the pipe. It’s your moat and your castle, so you get to decide what’s best. Make sure you fill it all back up with topsoil once you are done. It should be back to its original grade. We have a problem that causes the need for foundation repair here in Dallas. It’s called expansive soil. These soils contain smectite clays and other minerals that quickly absorb water. They increase the volume of the soil. The force this volume expansion exerts on your foundation is around 15,000 pounds per square foot. That’s an elephant per square foot heaving against your foundation. This soil has been known to move whole structures. But it’s a slow heave. The soil expands slowly and causes your foundation to crack. There are soils you can use to combat this. They work to mitigate expansive soils. If you notice your foundation shifting, talk to your foundation repair specialist in Dallas. They can help you figure out how to proceed from there. All you see when you look at a tree is the beauty and the shade and your son falling out of the branches because he climbed too high. But we see a hidden danger. Roots can be as wide as 4-7 times the top of the tree. Look at your biggest oak. That’s just the tip of the iceberg. If you have several trees in your yard, you’re looking at a root system the size of your house or larger. And roots are uncanny things. They almost seem to have a mind of their own sometimes. I’ve seen roots crawl up pipes and clog toilets. They can definitely push through your foundation. This is preventable. Your foundation doesn’t have to be subject to the Ents of old as they march on your mighty fortress. Root barriers are your best bet. You probably want to use a permeable barrier. Water still needs to drain away from your foundation. If you do decide on a root barrier, it should be at least two feet deep. Otherwise, you will find large roots still encroaching on your foundation. Water doesn’t just magically disappear from your house because modern plumbing is a thing. Thank the Romans for inventing pipes! But pipes can be your foundation’s enemy. They sweat, they leak, they add moisture as they do their thing. If your sewer system isn’t ship-shape and water tight, this could spell trouble. You’ll probably want some foundation repair specialist from Dallas coming to your house someday soon. How do we keep this from happening? What if the pipe is so far underground and under your foundation, you can’t get to it? The sump pump will be your savior. If you don’t already have one installed, it might be a good idea. This beauty will take both pipe leakages and rainwater, collect it in a basin, then pump it out and away from your property. Some places even require homeowners to make sure the drainage goes away from sanitary sewers. Make sure of the laws in your community before having one installed. There should be no reason to go it on your own when it comes to keeping your foundation safe. 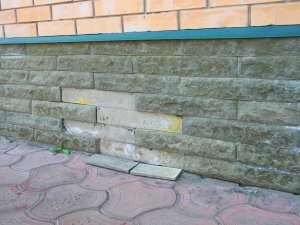 Call a foundation repair specialist in Dallas today.